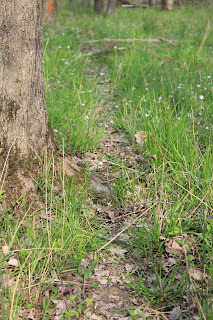 One of the benefits of having woods as part of my property, and being located next to a few hundred acres of forested county park--is the diversity of wildlife I am privileged to meet or simply observe. I have more than a dozen birdfeeders in my back yard, but not all birds like to feast at feeders. Many prefer the seclusion of the forest, or prefer the menu available there. In addition, a few small streams flow through the woods, providing water not just for drinking, but as an environment for amphibious creatures. At first, you might not actually see the residents of the forest, but they leave signs that let you know they were there. 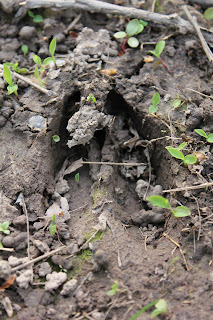 A deer print in the mud. 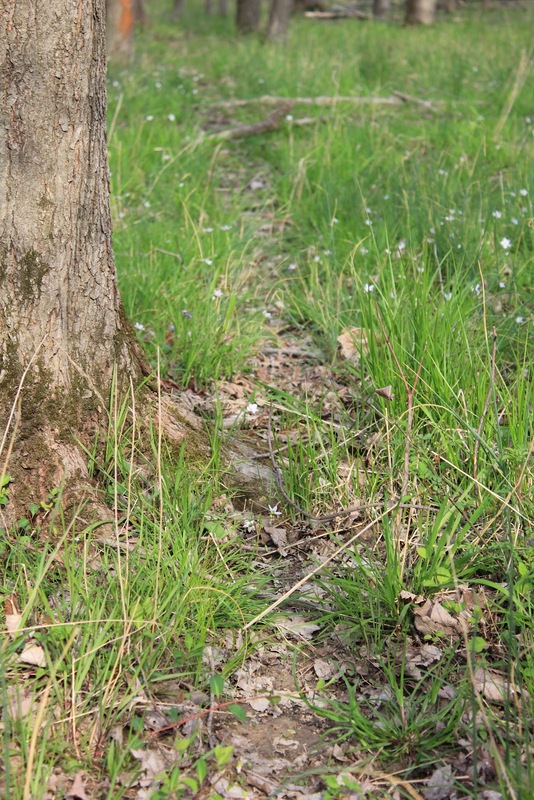 A trail shows where the deer tend to walk. Usually they see you before you see them. Three deer peer at me from afar. 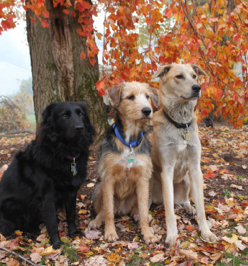 The color of their coats blends in with grey and tan of the trees. I'm in their neighborhood. I'm the intruder. Sometimes you hear them before you see them. Birdsong fills the forest; you need a sharp eye to catch a glimpse of some of the more shy species. When I think of robins, I think of wide green lawns. But their calls (which remind me of a high-pitched laugh) seem to come from everywhere in the woods. A tufted titmouse takes a break on a low branch. 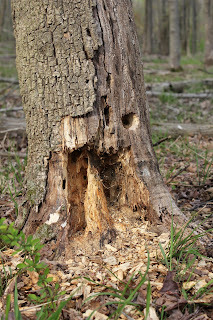 I'm pretty sure this was the work of a particular bird: the very large Pileated Woodpecker. And sure enough, she makes an appearance. I can tell this is a female Pileated because a male would have a red stripe on his face--above his "mustache." Sometimes the creatures are there, right in front of you, but easy to overlook. An ant drags a prize along a fallen tree trunk. I think it is a bird dropping; not much is wasted in the finely balanced ecosystem of the forest. I was staring at this frog for several minutes before I saw him, blending in among the aquatic plants and rocks in the stream. Once you see one frog, others seem to appear out of nowhere. And, as always, there is some representative of the greeting committee to welcome me back to the yard. 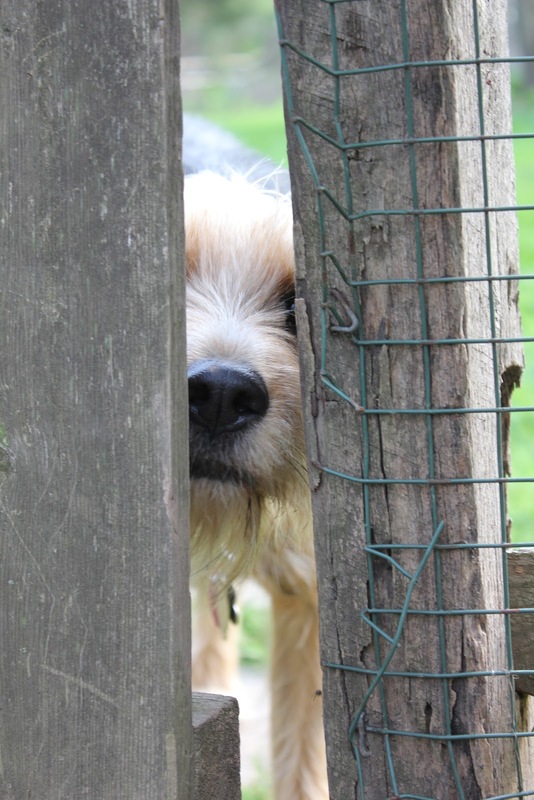 Tucker sticks his nose through the fence. Every time I walk in the forest, I find something new. The light changes, new plants bloom. Nests and dens are built, and babies born. This is why I live near the woods.